I have two questions relating to UK tax and MOT exemptions for 1979 vehicles. My Viva was registered on 06/04/79. As I understand it, vehicles that were manufactured or registered 40 years ago are now exempt from tax and MOT. I also realise that you must still go through the taxation process for the vehicle (for free) and keep it in roadworthy condition. My questions relate to cut-off dates. Essentially, on what date will my car be exempt? How do I find out a manufacture date? I have added some information found online below. well even though we are a viva club, we are not lawyers and or experts in legislation, I would have thought the correct people (some anyways) are those you have been to, e.g. the DVLA and or maybe other specialist site that deal with legislation not one make clubs that don't deal with this as part fo the clubs operation. Could always call and ask the DVLA? horse-mouth etc. Thanks both, will do so. As it's a rolling exemption based on the year of manufacture I would assume that any 1979 registered vehicle manufactured before 1 January 1979 would be exempt. However, proving when your Viva was manufactured will be difficult. Vauxhall Heritage do not hold accurate enough records to pinpoint the exact manufacture date but may be able to place it within a month. I believe that, for a fee, they do provide certificates showing the details they hold on a specific chassis number. I think it is clear that to be tax exempt your vehicle needs to have been manufactured before 1st Jan 2019 - as your vehicle was registered in April there is only a slim chance that it was manufactured in 1978 but as David says you can try for a certificate for date of manufacture. This means you will have to get it MOTed before you can tax it again regardless of if it is exempt or not. DVLA default position seems to be if it is 40 years old or more it is MoT exempt - if you continue to get an official MOT it will show on their records. I believe the MOT exemption is applied automatically once you get the taxation class changed to Historic which can be done at the post office once the car is old enough. Please confirm with DVLA but I believe you need to re-tax the vehicle and then once it hits the age bracket you can apply for Historic and the remaining time of PLG will be refunded. Essentially, on what date will my car be exempt? How do I find out a manufacture date? I have added some information found online below. The DVLA web site only ever talks about the current situation, so the page you link to is correct. Currently, vehicles manufactured prior to 1st January 1978 are VED-exempt. If nothing changes in legislation before that time, you can presume that on April 1st 2019, vehicles manufactured prior to 1st January 1979 will gain that exemption, and on April 1st 2020, vehicles manufactured prior to 1st January 1980 will gain that exemption. This is apparently in the Finance Act 2014, so that would need to be changed to remove the "rolling" exemption. I dislike the word "rolling" as it doesn't roll any more, it jumps once a year. But it's a term people are used to. You can get in touch with the Vauxhall Heritage Centre, and they will provide you with a certificate showing the month and year your vehicle was produced. If that turns out to be during 1978, you can send it to the DVLA and they will record the date of manufacture on your V5C, and your VED exemption will begin a year earlier. This was the situation with one of my cars. 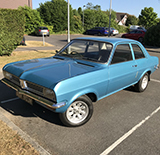 There is a caveat, though, and that is the "application for new registration" document was changed in 1976 or 1977, and when a registration was applied for, the dealer had to tick a box to declare that the car was new. If you now go back and convince the DVLA that your car was actually not new when first registered , you may well leave yourself in a situation where the DVLA will issue an age-related plate for the year that your car was actually manufactured. This has happened in several situations, and whether it bothers you I guess will govern whether you think it's worth the risk. If your car was registered in April '79 but made in December '78, in theory that would be the same year suffix in any case, so maybe the DVLA would not bother. I found that MOT exemption was applied automatically when I renewed my VED, but my cars were already in the "Historic" taxation class to start with. I'm glad you popped up Mike to provide a comprehensive insight to what is a bit confusing for many.